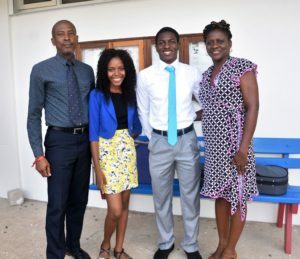 Brittanie Edwards and Ahmar Cumberbatch are the first two recipients of the QCA-UWI Scholarship. 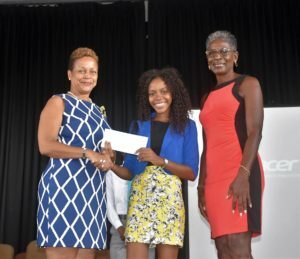 The recent graduates of Queen’s College received their scholarship awards from the Queen’s College Association (QCA) to help them in pursuing their studies at the Cave Hill Campus of the University of the West Indies (UWI). The QCA presented the inaugural scholarships during the school’s Independence assembly in the hall on Thursday, November 29. 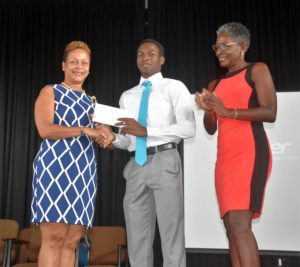 Each scholarship is valued at $2,500, and is intended to assist recipients in pursuing full-time undergraduate studies in any discipline at UWI, Cave Hill. Brittanie is studying International Relations with French, while Ahmar’s field of study is Computer Science with Electronics. Brittanie’s father, Lincoln Edwards, and Ahmar’s mother, Rhonda Griffith, were in the audience to witness the proud moment. QCA President, Michelle Daniel, congratulated the recipients, who are from the school’s 2018 graduating class. She encouraged them and current students in lower and upper sixth forms to join the QCA. Immediate Past President, Cecilia Stallard, told the audience that the QCA-UWI Scholarship is a means of extending the legacy of excellence of Queen’s College. Applicants were required to submit their educational record; as well as evidence of their involvement in organizations or associations and/or evidence of entrepreneurial activity; in addition to evidence of leadership at school or in the community.